thinking of new ways to make your life even better. 1. Your first audio empowerment session will arrive by email tomorrow. I can’t wait for you to experience how you can change your life in just minutes per day by simply listening to audio. Please enjoy! 2. Below are your Free recordings. The music is perfect for relaxing, calming your mind and meditating. The Theta brainwave entrainment recording is ideal for relaxing your mind and putting you in a super learning state. 3. 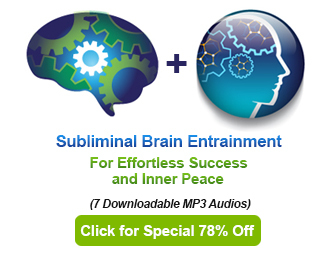 You have also given a Special Offer link for 78% off the Subliminal Entrainment recordings for one of our favorite Audio Experiences. You are listening to "Embracing all that is You"
Simply put on your headphones and click on the play buttons above to listen to these tracks. You can also right click on either of the blue highlighted track names above to download them. Theta brainwave frequencies are present during deep meditation, light sleep and REM dream state. By listening to theses wave your brain can enter these brainwave states. While listening to BWE you should not do any activities that would not be safe without your full awareness and attention. It is recommended that you also listen to our 20 minute recordings to create the proper response and receive the maximum benefits. This scientifically designed music was created to help you bridge your conscious and subconscious minds. Just listen to begin automatically experiencing more abundance, prosperity and opportunities than ever before. • Theta Brainwave Entrainment: Theta is known as one of the best states for communicating with our subconscious mind. When we are in a theta state, people are known to experience bursts of inspiration, intuitive realizations, promptings, and communication with divine beings. Some of the long term benefits of visiting the theta brainwave state are: • Deeper connection to your emotions • Increased intuition • Greater levels of energy and relaxation • Enhanced self-awareness • A greater ability to enter into a highly focused and effortless learning state. always seek the advice of a qualified professional with any questions regarding their personal concerns or conditions.